The 2017 Audi Q7 luxury SUV represents Audi’s attempt to combine a luxurious ride and passenger comfort with the practical utility of an SUV. From the trendsetting virtual cockpit to a powerful engine and excellent suspension, the Q7 is an excellent choice for anyone looking for a higher-end SUV for work or play. The Q7 has room for up to seven people across three rows of seats. The front seats come with standard heated leather upholstery, with optional power-adjustable front seats and massage features available for increased driving comfort. The second-row seating has sufficient room for up to two adults, with abundant head and legroom that will make long drives quite tolerable. Additionally, a tumble-and-fold feature for the second row makes it easier to access the third-row seating. Finally, the Audi Q7 can hold up to 71.6 cubic feet of cargo with both rear seat rows folded, dropping to 37.5 with the third row folded and 14.8 when all seats are in use. This is less than the average cargo room available for vehicles of this type, which may be an issue for larger families or owners who expect to be using the SUV for moving large amounts of cargo on a regular basis. The third-row seating is accessible but somewhat cramped. In most cases, adults will only be able to tolerate short trips in the back, leaving it best suited for smaller children. However, the third row can be automatically stowed in order to increase the Q7’s cargo stowage. Perhaps the biggest change in the Q7 is the fact that it’s been given an exterior that looks more like a wagon than an SUV. A completely redesigned interior makes for more accessible seating and a center control stack. Finally, the 2017 Q7 now offers two powertrains, as compared to the three options offered by its predecessor. All in all, the Audi 2017 has been completely redesigned for a new generation of drivers. The interior is designed for comfort and a quiet ride. Reviewers have commented on the Q7’s interior, considering it to be one of the most comfortable vehicles in its class. Leather seats and a well-designed finish combine to produce a luxurious and attractive interior arrangement for passengers and the driver alike. The Q7 comes with a powerful drivetrain and four-wheel steering, which combined with its active suspension, makes it one of the most maneuverable utility vehicles around. A supercharged V-6 combines with an 8-speed transmission to give the Q7 a highly responsive feel, whether it is driving on a suburban residential road or along a mountain highway. Generating 333 hp, the 3.0 liter supercharged V6 can take the Audi from 0-60 mph in 5.7 seconds, while also enabling the vehicle to two up to 7,000 pounds. Despite its power, the V6 engine is not a gas hog, providing 19/25 mpg for city/highway driving, according to fueleconomy.gov. Finally, the Q7 also offers a 2.0 liter, 4 cylinder engine. While not as powerful as the V6, it has improved mileage, coming in at an impressive 20/25 mpg for city/highway driving. Even the basic Q7 provides one of the most responsive and comfortable drives of any 3-row SUV on the market. With a low center of gravity, 5-link front/rear suspension, and Audi’s Quattro AWD, it is a pleasure to drive. The Prestige includes full air suspension and 4-wheel steering that improves the SUV’s already impressive maneuverability by shaving three feet off of its turning circle. For individuals living in urban regions where tight driving conditions are common, a tighter turning radius is well worth the extra expense. One of the most useful additions to the Q7 is the Audi Virtual Cockpit system, which replaces the dashboard indicators with a 12.3-inch LCD screen that houses the instrument cluster and can dynamically reconfigure itself to assist the driver. The optional night vision assistant, which uses a thermal imaging camera to detect people and large animals at night, displaying them on the LCD screen or the optional heads up display (HUD) can dramatically improve nighttime driving safety. The 2017 Q7 has received the IIHS’ top safety pick for 2017, with superior safety measures across the board. A full suite of driver and passenger airbags help protect the occupants in the event of a collision, while a number of active measures help to ensure that the Audi Q7 will avoid traffic accidents. Active measures include brake assist, electronic stability control, integrated turn signal mirrors and a rollover protection system. Currently, Audi offers the following trim levels. Prices are the current MSRP as suggested by Audi. 2.0 TFSI Premium Plus: $53,950. 3.0 TFSI Premium Plus: $60,450. The primary difference because the 2.0 and 3.0 packages is the fact that 2.0 trim levels make use of the V4 engine, as opposed to the more powerful V6 engine. The Premium trim levels are equipped with the standard package, including HD radio technology and driver information system. The Premium Plus package includes an available premium sound system, active lane assist option, and a standard navigation system. The top of the line Prestige package offers the most advanced features for the Q7, including night-vision heads up display, standard premium sound system, LED lights, and adaptive cruise control and lane change assist. The Q7 delivers on its promise of a luxury SUV driving experience. 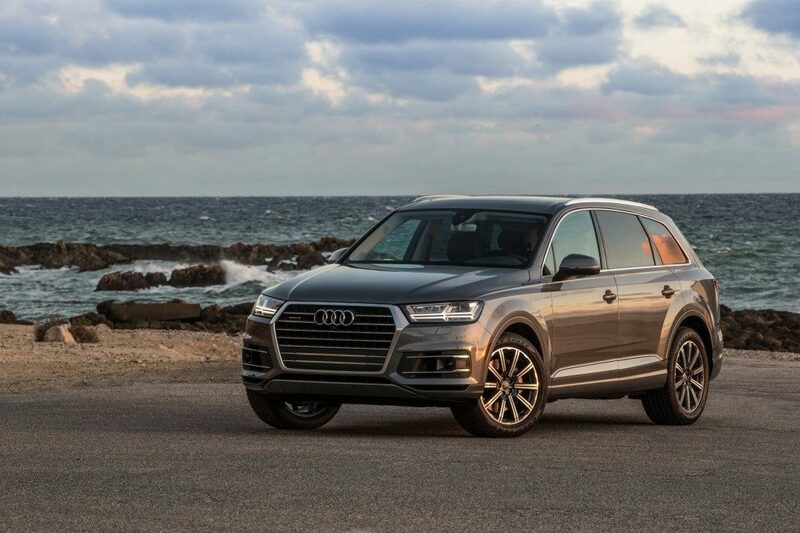 With abundant and useful features that are spread across all trim levels and a well engineered and attractive package, the Audi Q7 is a stand-out in the luxury SUV market for 2017. Thinking of buying a Audi Q7? Already own one? Leave a comment and let us know what you think!